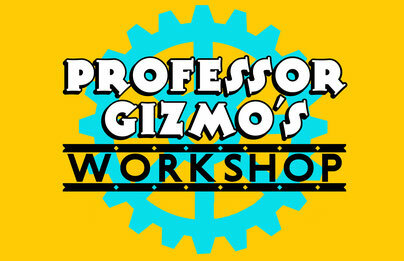 Hello, and welcome to Professor Gizmo's Workshop! My name is Gary Deslaurier, and my wife Annie and I have been teaching building, science and art based enrichment classes and summer programs at schools throughout the Rhode Island area for over fifteen years. We currently offer programs in local private schools, enrichment in the Barrington Public Schools, and are excited to be offering workshops through the new Artist in Residence Program sponsored by the Bay Spring Community Center. As guest artists, we have enjoyed teaching at The Pennfield School, New Art Center in Newton, Ma, and at Walnut Hill School for the Arts. As part of our community involvement, we have participated in The Robot Block Party in Providence, the Steam Connections event at Barrington High School, Primrose Hill and Hampden Meadows School Math and Science Nights, and Family Night events at the Gordon School.